Academic integrity is an adherence to a high standard of values regarding life and work in an academic community. Pursuit of knowledge and the creation of an atmosphere conducive to learning are both definite aspects of academic integrity, but its basis lies in the standard of honesty. 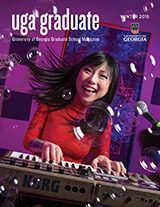 Students at the University of Georgia are responsible for maintaining and adhering to the strictest standards of honesty and integrity in every aspect of their lives. Honesty in academic matters is a large part of this obligation. Specific regulations governing student academic conduct are contained in the Student Handbook, and these should be read to avoid any misunderstanding. Students and faculty who suspect that an act of academic dishonesty has taken place should contact the Office of the Vice President for Instruction.